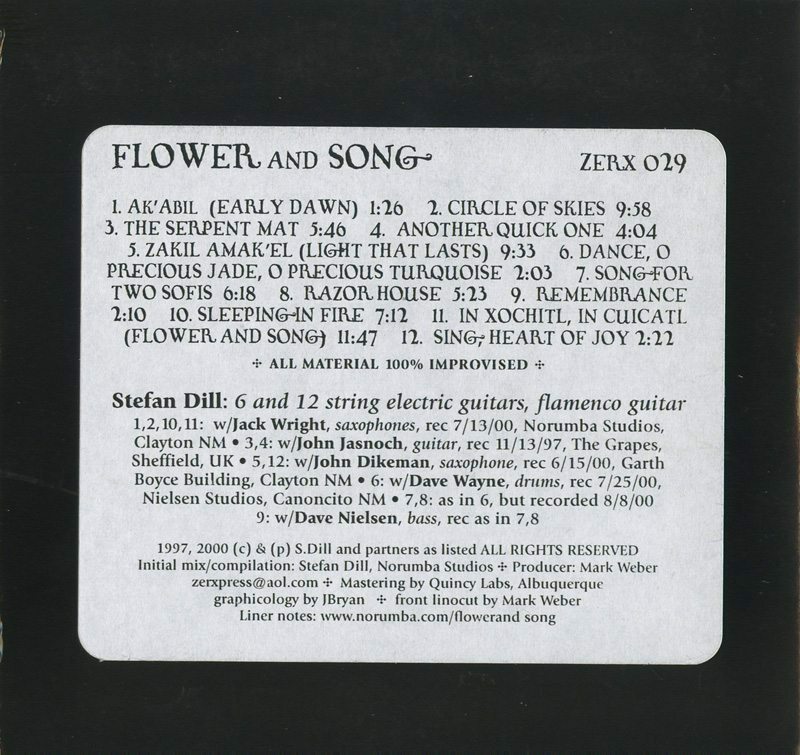 “Flower and Song” is an album of all duets featuring New Mexican Guitar virtuoso Stefan Dill. 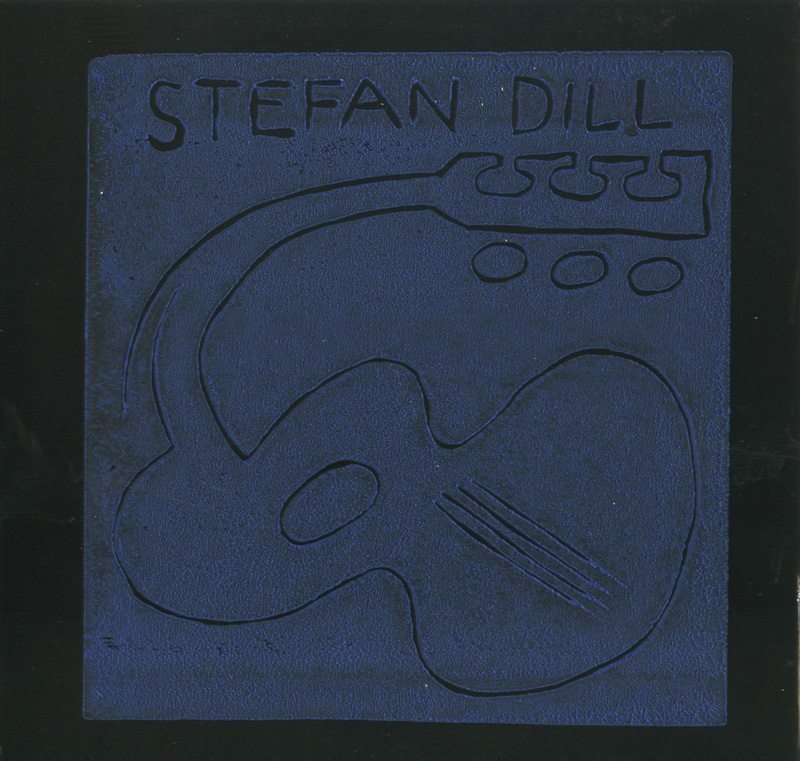 Complete album info may be found at Stefan Dill’s website, Norumba. “Although Dikeman’s sound is equally aggressive [as fellow saxophonist Jack Wright, ed.] , he uses longer connected and spiraling lines to convey similar feelings of structural abandon. Dikeman’s playing on the closing number is filled with heavy doses of rampaging fire.” — Frank Rubolino, Cadence Magazine, June 2001. “The pièce de résistance of the album is the splendid “Zakil Amak’El (Light That Lasts)” with Dikeman, a beautifully crafted nine and a half minutes, after which the duos with drums and bass come as something of light relief.” — Dan Warburton, Paris Transatlantic, Fall 2003.
my good friend Mark Weber released Flower And Song (Zerx 029), a collection of various duos, all fully improvised. Mark Weber (writer, musician, visionary, artist, iconoclast, and the guiding force/producer behind Zerx Records) and I had been discussing some kind of release under my aegis for a very long time. Not feeling particularly compelled to do another solo release, and Mark not particularly compelled to do a full tilt release of the current electric projects, we were at a bit of a loss. The initial genesis for duos was Mark remembering the John Jasnoch tapes from 97 and urging me to do something with them for his sampler release. The first of three cuts was chosen, the remaining ones to be possibly spread over future samplers. About the time I was cleaning out the incredible 50 cycle noise from the Sheffield tape ( louder than the music, courtesy of the British Yorkshire Electricity power company) I was blessed with visits in June and July from my student John Dikeman, followed by veteran improvisor Jack Wright. Rehearsals with the new trio began in late July, and there were some very good pairings within that. Listening to it all, I realized what was taking shape. Mark gave his blessing, and so here it is. Sifting through takes, I strove to find cuts that had the highest level of interplay, where common focus and spirit were most at hand. Dialogues and surprising simultaneities took precedence over solos (though Dikeman’s opening tour-de-force on the last cut was too good to pass up and is ironically the only extended solo passage on the album). All material was 100% improvised. There were no charts, no cues, no general plans. What you hear is how it happened. One of the principal attractions for me in performing improvised music is the telepathy, the connectivity that can occur between accomplished improvisors: the immediate call and response, the ability to find each others pitches, the simultanaeity of rhythmic gestures and phrases – all while hopefully making some compelling music – is what makes improvisation work or not.